The Grateful Dead first came to national prominence in the late-60's as San Francisco's premier psychedelic band. The group's initial line-up consisted of Jerry Garcia (guitar), Phil Lesh (bass), Ron "Pigpen" McKernan (keyboards), Bob Weir (guitar) and Bill Kreutzmann (drums). The group's self-titled debut album, released in 1967, was recorded in three days. Anthem of the Sun, their 1968 follow-up, took six months to complete. The group recruited two new members for the project: drummer Mickey Hart and keyboardist Tom Constanten. Recording began in Los Angeles and subsequently moved to New York where the group, with producer Dave Hassinger, experimented by grafting in-concert recordings with studio sessions. The live material had been recorded early in 1968 during a tour of the Pacific Northwest. On several tracks, most notably "That's It For The Other One," overlays of several concert performances were mixed together to create a multi-dimensional song suite. The album's second side highlighted a pair of live show-stoppers; "Caution (Do Not Stop On Tracks)" and "Alligator." 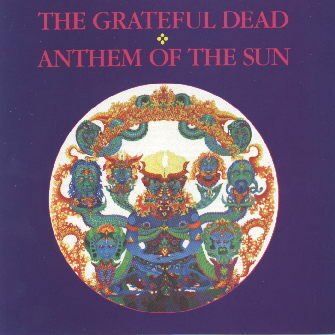 Composed entirely by the Grateful Dead, Anthem of the Sun featured a range of additional instrumentation including kazoo, vibraslap, Celesta Claves, harpsichord, prepared piano and electronic tape. 11/10-11/67 Shrine Exposition, L.A. (Producer Grateful Dead, Executive Engineer: Dan Healy; Asst. Engineer: Bob Matthews) Stereo Mix Mastering: Columbus Recorders, San Francisco; Criteria Studio, Miami; Apolstolic Studios, New York. Feb. 14, '68 - Carousel Ballroom, S.F. March 15, 16, (17), '68 - Carousel Ballroom, S.F. March 29, 30, 31, '68 - Carousel Ballroom, S.F. Anthem of the Sun was released on July 18, 1968.